Russia’s position on Syria became hopeless months ago. Instead of evolving, its position became increasingly intransigent. All the talk about Moscow being “unconcerned” about Bashar al-Assad’s fate was a smokescreen. It was meant to conceal the reality that Moscow joins Iran in considering Assad a “red line.” Russia and Iran work hand in glove in arming the regime and mapping out its survival, pending a solution tailored to fit it. To see the United States join the Russian-Iranian duet is no longer far-fetched. You can forget Washington’s earlier blabber about “a transitional government with full powers” and the need for Assad to step down. The two big powers will support whoever can stifle terror. They will stand shoulder to shoulder against any side impeding this priority. Obviously, they will want to rely on the regime, which is far from being gullible. The regime will request U.S. guarantees for its survival. The regime is aware, but has yet to acknowledge, that the Americans have already dried up the sources of financial and military assistance to the opposition, including the non-extremist side. 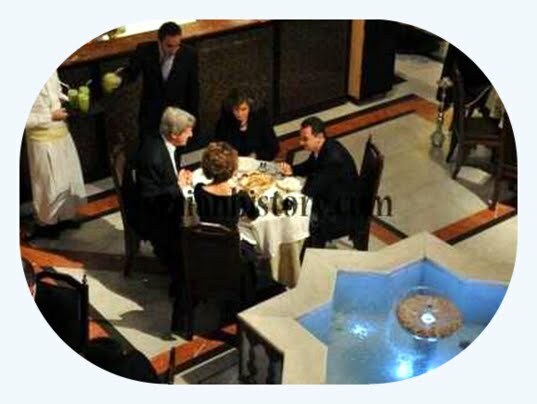 But the regime would also request the resumption of ties with Washington and a visit by old friend “Kerry,” who would have by then forgotten his earlier counsel to Assad to step down. That’s what you call the “Game of Nations” and the amorality of power politics in its ugliest form. Once American and Russian pragmatism converge and play ball with the brutal Assad regime, Syria can expect a muddier and more tempestuous chapter. The “game of nations’ leaves no room for peoples’ rights and “aspirations.” The Palestinian people can attest to such historic injustice. At best, the Syrian opposition will be cornered and told the balance of power leaves it no more than what the two great powers determined. The Syrian people demanded the protection of civilians. They demanded a no-fly zone. They demanded qualitative weapons to redress the balance of forces. They demanded relief aid. They demanded that children not be left to die from cold or disease. They got nothing from the international community. Whoever spoke of a “conspiracy” with the regime against the people was not far from the truth. Of course, America’s turnaround was not, and will not, be by electric shock. Nor will it be an easy matter, free of hurdles. As the Americans and Russians play up today the symptoms of Somalization in Syria, they are fully aware the regime created them. In addition, Barack Obama’s “non-intervention doctrine” effectively produced the same fallouts in Syria as those of the “intervention doctrine” of George W. Bush in Iraq. Russia, which justifies its intervention in Syria with a lesson in international law, gives a bad example of what the international community’s role should be. Indeed, the two powers would say anything to absolve them of any responsibility for creating the situation they now bemoan. They make it sound as though the Syrian people revolted, sacrificed and suffered simply to stack up al-Qaeda and other terrorists on their soil. Why and how Washington’s U-turn? 2. The obduracy of Russia, which exploited Syria’s plight to recover its “Great Power” status, thereby forcing the Obama administration to reluctantly choose between outright confrontation and a trade-off. The Americans have long been heard inviting the Russians to be part of the solution and not part of the problem. Here is America becoming part of the problem too. Should the anticipated policy change come true, America, like Russia, would become responsible for the Syrians’ killing and the butchery of their revolution.